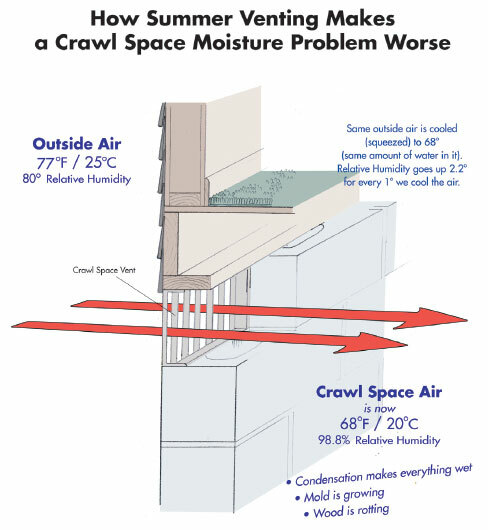 What Do Crawl Space Vents Do? Building a crawl space with vents was meant to ensure that air inside the home could be channeled outside. Instead, this method pulls air from outside into the crawlspace. That outside air is unconditioned (not heated or cooled with air conditioning) and brings in heat in the summer and cold in the winter. Since your crawlspace is not separated from the housing envelope, your floor is cold in the winter and the whole house is affected. To prevent this, builders will sometimes install crawl space insulation on the floor joists in order to protect the house from the crawlspace environment.